– All events listed below are FREE to the public. For a list of many other local September events, please review the Chattanooga Events Calendar . Reflection Riding Fall Native Plant Sale 2015. We love this sale and the wonderful plants. Reflection Riding Arboretum and Nature Center, located at the foot of Lookout Mountain, will host its Fall Native Plant Sale on Friday and Saturday, September 9-10. 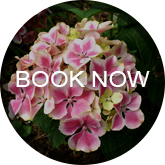 We have purchased numerous plants from Reflection Riding for our gardens, and we are always impressed and pleased with the plant quality. Check their website for the schedule of interesting and informative presentations available that weekend. 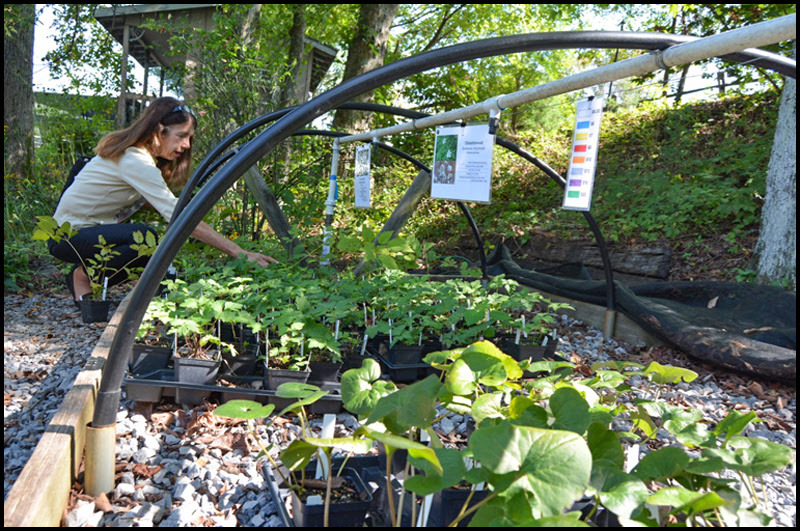 According to the National Drought Mitigation Center, Hamilton County, Tennessee has endured extreme drought conditions this summer, presenting significant challenges to establishing our gardens surrounding St Francis Cottage. As Shunryu Suzuki wrote, “A garden is never finished,” which is especially true with such limited rainfall. So, we continue to plant, water, sow, and pray for rain. We are beginning to gear up for the fall planting season with hope for consistent rainfalls to enable spring bulbs, plants, shrubs and trees to bloom for our first guests to enjoy. Fortunately, our first hard frost doesn’t hit until around mid-November, so we have time to plant once the summer heat subsides a bit. St Francis Cottage Bed and Breakfast Going Up Quickly! After three and a half years of planning and the roller coaster ride of bureaucracy, a lot has been accomplished since breaking ground in late May of this year. Under the guiding hand of Cole Poorman of America's Home Place, the foundation, framing, windows (Oswaldo Nunez Framing), are all in place. Electric wiring and plumbing are well on the way. HVAC plans have been established and the work should start next week. Kitchen cabinets have been measured and will arrive in about 8 weeks. Siding has been delivered and the west wing is covered. Most of the internet and cable infrastructure has been installed. And the fire sprinkler system is nearing completion. It's all a bit overwhelming, but we love it! Our applause and thanks go out to all the hard working crews on each part of this job. The heat and humidity has been pretty brutal, but progress continues amidst Chattanooga's hot, hot summer of 2016. Progress as of July 29, 2016. Though not pictured, siding has been delivered on site. Read more to see more progress . 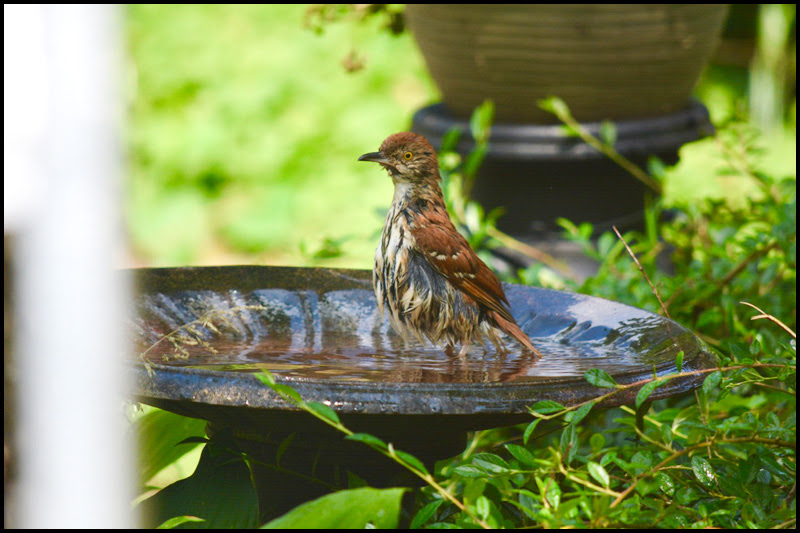 . .
Brown Thrasher cooling off in our present birdbath. We absolutely love watching and listening to the many native bird species that dwell upon, or visit our property, from the Eastern Bluebird and the preverbal Cardinal, to woodpeckers, owls and hawks. What a wonderful way to begin our day by watching the smaller birds feast at the bird feeders or splash around in the bird bath.